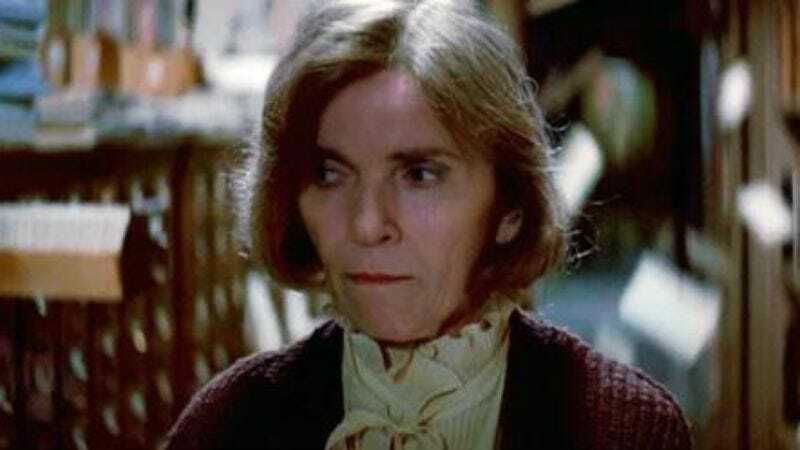 Alice Drummond, the prolific character actress best known for small roles in films like Ghostbusters—where she played the New York librarian terrified by the film’s first spectral apparition—has died. Drummond was 88. Drummond spent much of her career on and off-Broadway, where she was nominated for a Tony Award in 1970. That came shortly after she broke into TV, with a recurring part as Nurse Jackson on ABC’s vampire soap opera Dark Shadows. Drummond would work steadily on-camera for the next 40 years, often in roles capitalizing on her small frame, sweet voice, and talent for cheerful, slightly off-kilter smiles. Over the course of her career, Drummond would play off some of the most powerful comic voices of the 1980s and ’90s, sharing scenes and trading banter with Bill Murray, Robin Williams (in Awakenings, where she played Lucy, the comatose patient capable of catching a thrown baseball), and Jim Carrey, in Ace Venture: Pet Detective. The latter role—as the deranged-but-doting mother of the film’s villain, Ray Finkle—showed off Drummond’s considerable comic chops, pivoting from sweetly offering Carrey’s character football-shaped cookies, to wishing an STD on the hated Dan Marino. Drummond’s last role was in 2010, in the Brendan Fraser film Furry Vengeance. According to Variety, she died in her Bronx home Wednesday night, of complications from a fall.